Calendar: «Easter» & cards, «Easter Monday in U.S. Virgin Islands» & cards. «The great gift of Easter» illustrated quotation. Easter Quotes, Sayings, Verses, Poems, free quote pictures for Facebook, Twitter, LinkedIn, Reddit, Pinterest and other social networks. 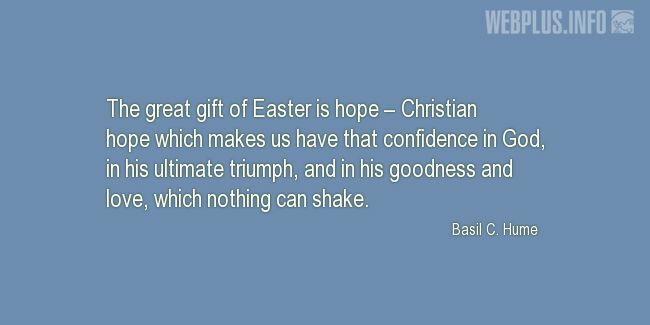 The great gift of Easter is hope – Christian hope which makes us have that confidence in God, in his ultimate triumph, and in his goodness and love, which nothing can shake.